“God does not have problems. Only plans,” proclaimed Corrie ten Boom when a clerical error allowed her to be released from a Nazi concentration camp one week before all women prisoners her age were executed. Though she was released from the horror of Ravensbruck concentration camp, Corrie continued to live with a remarkable reliance on God, just as her family had as they hid Jews from Nazi terror. Generations of ten Booms held Christian prayer meetings for Israel for 100 years prior to World War II. 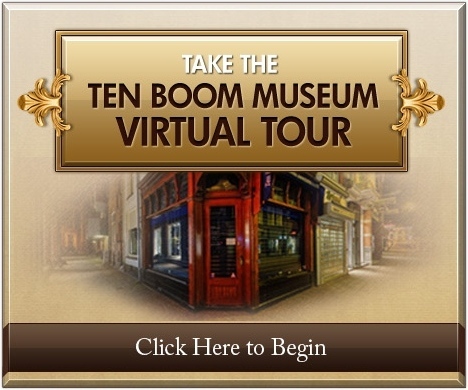 Click here to begin our inspirational virtual tour of the ten Boom home. Traveling the world as an ambassador of the power of forgiveness in Christ, Corrie later established rehabilitation centers to help other Holocaust survivors. Her 1971 autobiography, The Hiding Place, became a movie in 1975, inspiring many to see God at work through the darkest of life’s circumstances. You can preview a portion of this powerful movie within our virtual tour by using the compass to visit location #3. You can become a part of Corrie’s incredible legacy.